The striking, elegant and curvaceous form of the 'JoJo' stool seat has an almost plastic characteristic due to the innovative 3-Dimensional ply forming technology, which Johannes and Peter have utilised magnificently in this design. 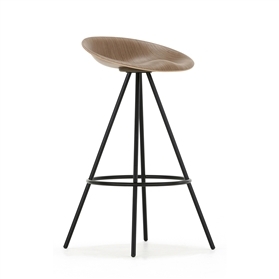 The resultant organic and ergonomically friendly form provides, arguably one of the most comfortable stool seat shapes possible. Chrome frame with American Walnut seat.